2016 Olympics gold medalist Matthew Centrowitz will appear with his two-time Olympian father at a Nov. 21 NPC Newsmaker event. What does it take to win the gold medal? 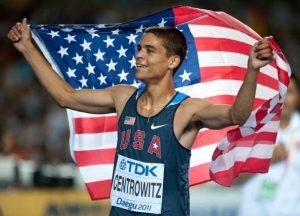 Matthew Centrowitz, who at the Rio Olympic Games this summer became the first U.S. Olympic Gold 1500 meter (the “metric mile”) track winner since 1908, and earlier this year won the World Indoor Championship, and his father, Matt, a two-time Olympian distance runner and cross-country and track coach at American University, will be the featured Newsmakers at the National Press Club on Monday, Nov. 21, at 9:30 a.m., in the Club’s Fourth Estate restaurant. The father and son Olympians will discuss the training leading up to the Olympics, the experience of the Games and strategy in the race itself, and plans now and for the future. In the race on Aug. 20, just three months ago, Centrowitz broke through the pack in the last 150 yards and sprinted to a dramatic win. Matt and Matthew will discuss the impact of “fatherly advice” to the son and how his father’s Olympic experience served as a role model and inspiration. Matthew will discuss his past and current training and races.